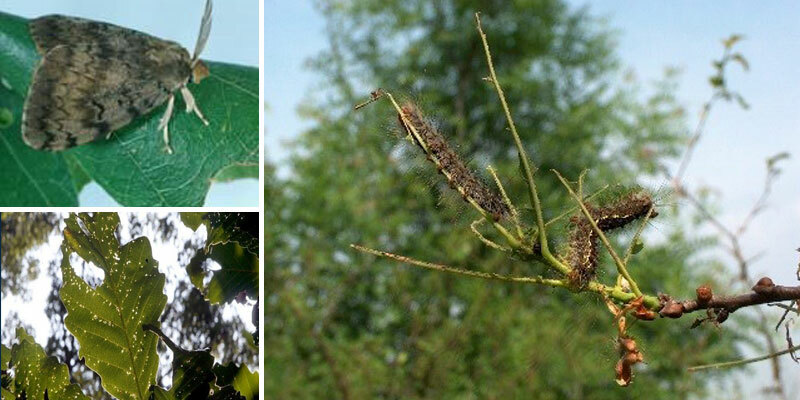 The Rhode Island Department of Environmental Management (DEM) is advising homeowners that it does not anticipate widespread defoliation of trees by gypsy moth caterpillars in Rhode Island this year, as occurred in 2016 and 2017. There will still be some localized areas, however, where tree defoliation may be severe. Surveys conducted last fall by DEM's Division of Forest Environment showed a marked decline in the number and size of gypsy moth egg masses in the environment; thus, there will be fewer caterpillars hatching this spring. Areas expected to be hit hardest include central Providence County and Washington County, although all forested lands, parks, and urban green spaces are still somewhat at risk. Spring rains last year promoted the emergence and spread of the Entomophaga maimaiga fungus, a pathogen deadly to gypsy moth. This resulted in significant caterpillar mortality. Spring rains this year will once again release Entomophaga, likely causing a total collapse of the caterpillar population. Unfortunately, some trees will be defoliated before this happens. A report on the status of the current outbreak can be found by clicking here. Homeowners may opt to apply insecticides to control caterpillars on their property, minimizing damage to their trees. Products containing the active ingredient "Btk" are recommended and widely available at retail outlets. Many tree care specialists are licensed in pesticide application, and may be contracted to do so. Click here for information on contracting with a tree care specialist providing this service. DEM does not advocate for the widespread use of pesticides in forested areas because they also harm beneficial insects, such as bees and butterflies, and has no plans to apply pesticides this year. For more tips on caring for trees, visit www.dem.ri.gov. Follow DEM on Twitter (@RhodeIslandDEM) or Facebook at www.facebook.com/RhodeIslandDEM for timely updates. Did You Know that the gypsy moth is an invasive species and most of the gypsy moths in North America came from Europe? It was accidentally introduced in the late 1860s in Medford, MA. One of the most devastating forest pests in the Northeast, the gypsy moth is continuing to spread its range. Less desired but still attacked are maple, black, yellow, and paper birch, cherry, cottonwood, elm, black gum, hickory, hornbeam, larch and sassafras. Older gypsy moth larvae devour foliage of several species that younger larvae normally avoid, such as hemlock, and pines and spruces native to the East. "Despite over 100 years of presence in North America, researchers are still at a loss to explain and predict the extent of the changes in forest vegetation likely to take place through gypsy moth disturbance," according to the U.S. Forest Service. "A major concern is the potential loss of economically critical and ecologically dominant oak species (Quercus, spp.). Most studies of forest compositional changes with gypsy moth defoliation indicate that less susceptible species will dominate the forest, so in effect, forests may have fewer gypsy moth problems in the future."